CLICK HERE for Tabs for Satriani Find the Note Pt. 2. Use the 12th fret as a reference point. The 12th fret (double-dot on the neck) is the same note as the open string. So, if you know that the fifth string is called the A string, then you know that the 12th fret on that same string is also an A, just an octave higher. Once you get this idea, you can do the same idea with fretted notes. So, if you know that the 3rd fret on the fifth string is a C (usually the first dot on the neck is at the 3rd fret, but some guitars have an inlay on the first fret – but let’s just call the 3rd fret the first dot by thinking of a Stratocaster neck) – then you can figure out that the 15th fret is also a C (that’s the first dot past the 12th fret). Think of the neck from 12th fret higher as a miniature guitar, since it is simply a smaller repetition of the first 11 frets. Be patient, go slow. Don’t rush this. Take as much time as needed. This is an ongoing project, so once every week or so, pick one note and try to find all of those notes on the fretboard. Use a note you already know as a reference. So, if you know where all of the A’s are on the guitar, you can use that as a reference point for all of the Bb’s, as Bb is only a half-step (1 fret) higher than A.
Richards Guitar Studio offers professional guitar lessons, bass lessons, drum lessons, and rock band school Richards Rock Academy in Aston, PA. 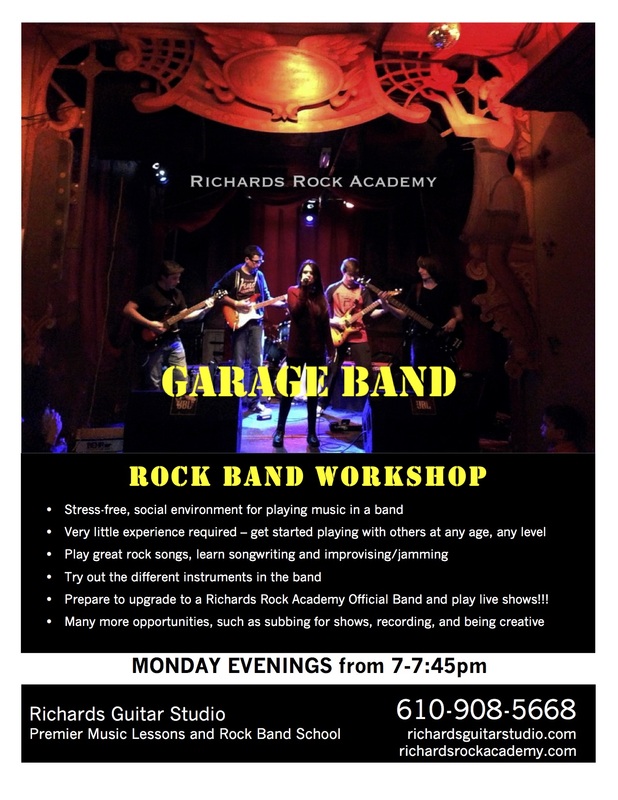 Serving Delaware County, PA. Visit www.richardsrockacademy.com for rock band info.